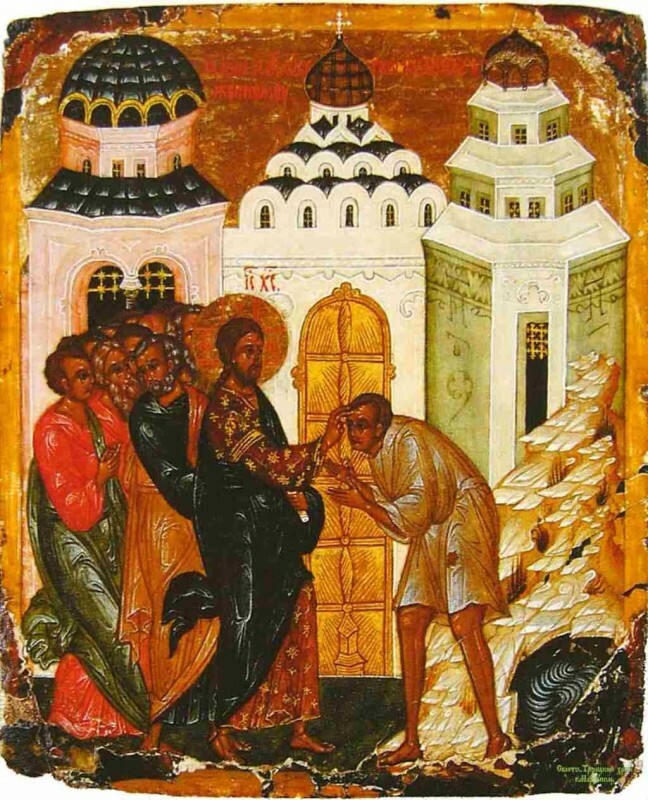 On this final Sunday before the leave-taking of the feast of Pascha, when we greet one another with the words of the glad tidings of Christ’s Resurrection, the Church directs our gaze to one of the Savior’s miracles, singling out this event from a series of similar ones. 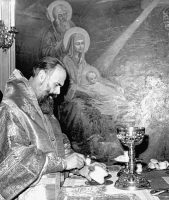 It is worth noting that each of the six Sundays of Pascha is named after the Gospel event commemorated on that Sunday. On the first Sunday after Pascha we learned judicious caution from the “good unbelief of Thomas”; on the second Sunday we marveled at the selfless love of the Holy Myrrh-Bearing Women and the Righteous Joseph and Nicodemus; on the third Sunday we praised the paralytic for his long-suffering; and last Sunday we learned from the Samaritan woman to listen and obey when the Lord Himself speaks with us. On this, the final Sunday before Christ’s Ascension, a man appears before our eyes who is remarkable in every regard, for which reason the Savior casts His keen gaze upon him. The Savior answered that this man was born blind that the works of God should be made manifest in him (John 9:3). He then manifests these works: He spat on the ground, and made clay of the spittle, and He anointed the eyes of the blind man with the clay, and said unto him, Go, wash in the pool of Siloam, (which is by interpretation, Sent.) He went his way therefore, and washed, and came seeing (John 9:6-7). 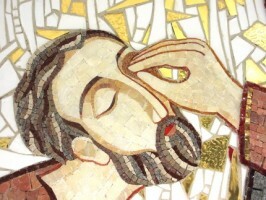 A miracle hitherto unheard of and unprecedented took place: the healing of a man born blind. What joy was granted to this fortunate man, who beheld with pure and clean vision the light and beauty of the world around him! His transfigured face reflected this joy, while the wondrous and astonished gaze of his glowing eyes shone with rays of heavenly glory. He underwent such a powerful transformation that his neighbors and those who had seen him before did not recognize him. But, having received the testimony of the healed man himself, they brought him to the Pharisees, those zealots of the Law, that he would testify before them of this great miracle. On one hand, a stark picture of spiritual blindness – the most terrible and dangerous kind of blindness – opens up before us; on the other, the works of God continue to unfold in the healing of the formerly blind man. The confrontation between healed blindness and unhealed blindness, manifested so plainly and clearly in the scene of the questioning of the man born blind, will be repeated endlessly throughout the history of humanity: in the martyrdom of the first Christians, in the dogmatic disputes of the Ecumenical Councils, and in the sacrifices of various fashionable revolutions, whether red and bloody or multicolored and velvet. Blind and wicked lies will always hound truth. But what is most astonishing is that the stronger and more refined the persecution of truth, the more fully and vividly the truth reveals itself. This can be observed in the example under consideration: the greater the means used by the Pharisees to obscure the miracle of the healing of the man born blind, by interrogating him and his parents, the bolder and more convincing become the healed man’s words witnessing to the truth. “But this is the nature of truth,” remarks St. John Chrysostom, “by the very means by which it seems to be assailed by men, by these it becomes stronger, it shines by means of that by which it is obscured.”  To the Pharisees’ rebuke that the Healer had violated the Sabbath and is therefore sinful, the blind man whose eyes had been opened replied simply and directly: Whether He be a sinner or no, I know not: one thing I know, that, whereas I was blind, now I see (John 9:25). Finally, this poor and despised man, responding to the Pharisees’ acknowledgment that they did not know where this Wonderworker was from, defeats his opponents with clear and logical arguments, thereby teaching the teachers himself: Why herein is a marvellous thing, that ye know not from whence He is, and yet He hath opened mine eyes. Now we know that God heareth not sinners: but if any man be a worshipper of God, and doeth His will, him He heareth. Since the world began was it not heard that any man opened the eyes of one that was born blind. If this man were not of God, He could do nothing (John 9:30-33). That which the Pharisees feared most took place: they were put to shame in a theological argument in front of the entire people. They were defeated, moreover, by a man who, on account of his blindness, had not read a single verse of the Law of Moses. But the Jewish people were accustomed to take arms against anyone who had fallen in a theological dispute. The Pharisees could not endure such shame. Here they found a way out of this dangerous situation: how could this insignificant man dare teach them? He was cast out and banned from the synagogue for insulting the dignity of the teachers. 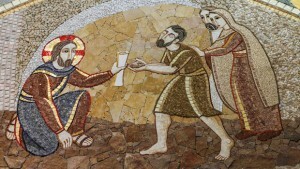 Thus, the man born blind, who had received healing and great joy, became a social outcast for witnessing to the truth. There are days in the lives of men into which eternity can be fit. Such was the blind man’s day when the Lord healed him: the entire universe beheld what he said and did on this day, because his words and deeds were entered into the book of eternity. After the blind man had confessed Christ as God and worshipped Him, the Savior spoke these words: For judgment I am come into this world, that they which see not might see; and that they which see might be made blind (John 9:39). These words are of direct relevance to us, especially those of us who have received a theological education and consider ourselves to be, if not universal teachers, then at least teachers of local import. We all have knowledge, says the Apostle Paul, and knowledge puffeth up, but love edifieth (1 Corinthians 8:1). For our knowledge not to turn us into blind Pharisees, we need to try to turn the knowledge we have acquired into love, that is, we should sacrifice ourselves, our time, and our interests on behalf of our neighbor, whoever he may be, by sharing our knowledge with him generously and not ascribing any merit to ourselves for possessing it. 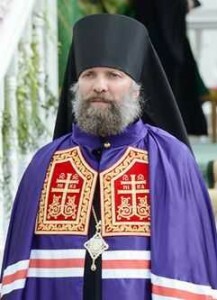 Delivered on May 9, 2010 in the Protection Church at the Moscow Theological Academy.